It usually takes reading a few books by a given author before they end up on my auto-buy list but, occasionally, an author hits it out of the park on the first try. So was the case with debut historical romance author Heather Snow. 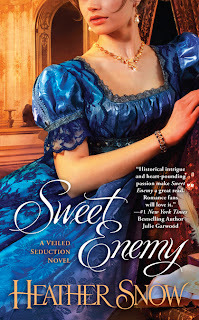 Her first book, Sweet Enemy, kept me happily reading late into the night and has me now counting the days until the August 7th release of Sweet Deception, the second book in Snow's Veiled Deception series. Home from the war, Geoffrey Wentworth, Earl of Stratford is settling into the responsibilities of the earldom he never expected to inherit and focusing all his energy on pushing a bill through Parliament that will help his fellow soldiers; those men who have neither title nor wealth nor homes waiting for them when they return to England. Geoffrey's mother has other ideas. Summoned home on the pretext of an emergency, he discovers guests already arriving with invitations in hand for a house party; invitations supposedly issued by Geoffrey for the express purpose of finding a bride. Needless to say, he is not amused but his clever (and very manipulative) mother has included the daughters of powerful men whose backing Geoffrey needs to see his soldier bill pass. Unfortunately for Geoffrey's mother, one of the guests has brought along her niece, a most unsuitable candidate for the type of wife he needs but perfect for type of wife he wants. In her simple satin dancing dress trimmed with shiny gold piping around the sheer sleeves, hemline and bust, she stood out in stark contrast to the wasted opulence that surrounded her. He remembered how ill at ease she'd seemed this afternoon surrounded by some of the more frivolous members of society. Nothing in her mannerisms gave her away tonight, but he got the distinct feeling that she, like him would be more comfortable with soldiers and commoners than with this lot. She laughed at something Aveline said, and the husky timbre of her voice vibrated through Geoffrey, his body hardening in reaction. Just being in her presence affected him, had from the moment he'd broken her fall in the library. It was as if his very skin hummed with energy, every nerve on edge. The closest feeling he could compare it to was the invigorating moments just before battle, when he felt more alert and alive than at any other time in his life, ready to take on the world. He hadn't taken her to task for stealing his horse. He hadn't berated her for embarrassing him in public. He hadn't judged her for her unconventionalities and was now, in fact, conspiring to enable her. "You are very kind," she said, and realized she spoke the truth. How awful. She didn't want to think of him as kind. She didn't want to think of him at all, except as a suspect or a relation thereof. Yet increasingly she was viewing him as something more than an adversary, which only complicated matters. Nor does she expect to find a man unimpressed with his position in life who is more concerned about the fate of those far below him in class. And she especially does not expect to find a man impressed with her intelligence, who treats her with respect, understanding and support of her chosen career; a man whose plans to help those less fortunate could go down in flames if he chooses Liliana. Knowing how much it will hurt Geoffrey if what she suspects is true, will Liliana abandon her search for her father's killer? How will Geoffrey react when he discovers that the woman he's come to know, trust and love has been lying to him the entire time about her reasons for being in his home? And will they ever discover just who the murderer is? Passionate, witty and refreshingly original, with a hero and heroine I fell in love with and a mystery that kept me guessing throughout most of the book, Sweet Enemy is a treat not to be missed. If you haven't read it yet, I highly recommend picking up a copy today! Has a debut book knocked your socks off lately? Tell us about it! Offhand I can't think of a debut book that has affected that strongly. I have heard so many wonderful things about SWEET ENEMY. I can't wait to read it. These two do sound like wonderful characters. I read a post comment by her this week about her RT experience. I have tried to find it but can't. I certainly hope I have my facts straight. It seems she sat at the table during the book signing/sale, not having much luck. She took her sign and wrote "She is a Chemist" (or something along those lines) and soon had people stopping and buying her books. Goes to show we like smart heroines that are a bit out of the norm. I've got Heather Snow's "Sweet Enemy" in my hot little hands as we speak and cannot wait to get started on it. Flora, I think you're really going to enjoy Sweet Enemy. It's smartly written, with a brilliant heroine and a hero I dare you not to fall in love with. I think you'll like this one, Gannon! Great reviews are always inspiring and Sweet Enemy certainly makes it in my to-read list. A debut novel that was a real joy to read is FEVER by Joan Swan...and the cover is not the only hot thing about this book! I'm definitely going to be reading this book because it's gotten so much attention, but I'm not really one who enjoys that "I'm averse to marriage" type heroes and heroines because they're so overdone. The chemist thing seems gimmicky to me, but I'm very interested to see how she handles it. I think the debut I loved the most was Sherry Thomas's. She is amazing. I was committed to auto-buying her for the rest of her writing life from page one. What a voice! Anna, I know many people who would agree with you on Sherry Thomas! I hope you enjoy Sweet Enemy. I didn't find her being a chemist at all gimmicky. It's who she is, an intrinsic part of her that's a byproduct of being raised by a single father who shared his love of science with her from the time she could talk. Also, I think the fact that the author has a degree in chemistry helped to keep the heroine very natural in that role. Another great review, PJ, and another book about which we agree. Mary Balogh and Jo Beverley both became autobuys for me with their debut novels and have maintained that status for more than two decades now. Most recently, I adored How to Dance with a Duke, the debut of our mutual friend Manda Collins. Celia Grant's debut A Lady Awakened left me speechless with wonder, and I eagerly await A Gentleman Undone, which releases May 29. I agree with you on Manda's debut, Janga. Counting down the days until book two! I found Celia Grant's debut very intriguing and exceptionally well written. She's a new author I'll be reading again. Wonderful review, PJ! I have this one on my wish list and plan to purchase it soon. I love intelligent heroines so I'm sure to love this one. Great review! I would love to read this book. I have heard so many good things about it. I haven't read this book yet, but it's always fun discovering debut authors. I found Sherry Thomas and Julie James around the same time and they became auto-buys. Unfortunately, I don't have any recent discoveries. I love Julie James! She hasn't hit a wrong note with me yet! Awesome review! I missed you at RT's! I met Heather Snow and she is as awesome as her book. I have a feeling that Erin Knightley will be the next 'first' author to knock our socks of with her "More Than a Stranger" [which is coming out in June, and I'm in the middle of right now]. Hi Melanie! One of these years I'm determined to make it to RT! Hope you had a good time! I've heard a lot about Anna Randol's debut. I have the book but haven't had a chance to read it yet. I've also started hearing advance buzz about Erin Knightley. Looking forward to reading her book! I think you'll like it, Buffie. I've been hearing such great things about your book. I'm halfway through Tracey Devlyn's A Lady's Revenge and loving it. I haven't heard about Devlyn's book. Off to check it out. Thanks, Catslady! I loved this book, I am another fan of a smarter than your average bear heroine. No book comes to mind. SWEET ENEMY is already on my wish list.